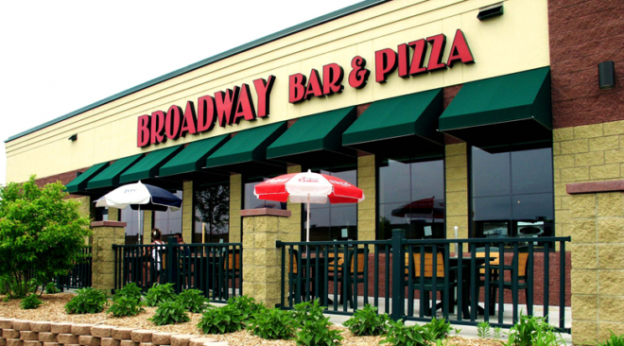 Broadway Bar and Pizza in Blaine, Minnesota offers mouth-watering, hot, fresh home-baked pizza made with their secret sauce, excellent sausage recipe, and a freshly made dough. Food and banquet are the primary services provided. Besides the high-quality pizza, the restaurant has a flexible menu that everyone can adapt and also offers a kid-friendly dining encounter. The menu includes burgers, sandwiches, appetizers, salads, desserts, and drinks. You can choose to have your full cuisine served in the serene environment of the restaurant, have it as a take –away or have it delivered to your doorstep. Keep Reading on to find out why you should visit here for a bite. You deserve to experience the beautiful dining at a friendly cost. At Broadway Pizza Blaine, prices range between $15-$25. The amount of meals served is worth the price. There is nothing more fulfilling than knowing that you can comfortably take your family or friends out for lunch which you can quickly pay. Broadway Pizza Blaine has plenty of space which can accommodate groups of 45 or more people. Ample parking space is also available if you have a car. Whether you are having a wedding anniversary, a birthday party or any other event, this is the place to be. At Broadway Pizza Blaine, you will get a sophisticated menu where you will have plenty of choices to make. Onion rings, meatballs, spaghetti, Mozzarella sticks, French fries, spinach dips, garlic toasts, and pepperoni flatbread are the major delicacies. All these meals are served fresh and hot. Kids are not left out as there are a Lil’ folks Special for kids and of course the award-winning pizza. Lunch, dinner and late-night snacks are always available. The restaurant opens at 11 am and closes at 1 am. You can start off with the Broadway sampler, skins, cheese curds or Eagle wings. There is always something special for you, like fettuccine Alfredo, the hot hoagie or the baked lasagna. For lunch, you can try the famous lunch buffet and a burger basket or the trademark fresh salads for dinner. A television which is always programmed so that sports is on all TVS most of the time is quite refreshing. The Jukebox and the Buck Hunter are exciting too. The happy hour on Sundays is quite uplifting as you can enjoy the six dollars one-topping pizza and significantly reduced prices on beer. The Sunday Bingo is also entertaining. The staff is friendly and quickly responds to orders. They are always happy and consistent with their service. Offering excellent service is one of their core values, and they strictly adhere to it. You can never get ignored or served rudely. The staff is always fun to interact with, and they will even sit close to you in case you want their immediate attention. Trust Broadway Pizza Blaine to deliver your orders to your doorstep. You will not have to wait for hours because it will only take them a few minutes to give. In about 25 minutes you will have your order. You will receive an email confirmation, and you can be sure that they are working on it. Staying true to its customers is what Broadway Pizza Blaine is known. The train which goes round and round a frill has always been there, and it’s so exciting to watch. The welcoming atmosphere and pizza which is the primary draw. You can choose any pizza you want, and you will get just what you asked. The restaurant offers outside accommodation whereby you can sit as a group or individually. Chatting with friends or family within the restaurant’s surroundings is an excellent experience as you will not get distracted by other people who came to a different activity like playing Bingo. With free wifi, you can access your social media as you enjoy the finger-licking meals. Broadway Pizza Blaine ensures that the wifi is always functioning. You can as well bring with you your office work and take your time to work on it. You will get to enjoy different kinds of beverages, including iced tea, orange, tomato, apple, grapefruit and pineapple juices, hot chocolate, coffee and root beer. People using wheelchairs can easily access the facility as they are allowed. You don’t have to worry about leaving your friend or family member who gets confined to a wheelchair in the car.They will also enjoy the activities as well. The volume levels of the music played are just appropriate. You will enjoy your meals or any other activity. If you are bringing your family or friends, you will chat freely without distraction from the loud music. The level of cleanliness gets highly observed. You can rest assured that you will get to enjoy meals prepared under strictly adhered hygiene rules. Broadway Pizza Blaine keeps the health of its customers in mind. Therefore, you should not worry about contaminated food. Broadway Pizza Blaine is the ideal place to visit. Whether you are in town for a few days or you live within, you will experience the top-notch hospitality and tasty meals. Imagine having a train designed merely to travel around and outside of the room to bring your order isn’t it fun? The old Pizza Hut style is something else you will encounter. Make plans for when to visit this place or just, make an order online, and it will get delivered to you. This entry was posted in Shop on November 16, 2018 by Tom.